Use this simple blood pressure chart to tell you what your blood pressure readings mean in terms of your health. The left side of the chart is a blood pressure range of systolic pressures (maximum pressure in your blood vessels - when the heart beats). The bottom line of the chart is the diastolic blood pressure (minimum pressure in your blood vessels - when the heart relaxes). Your blood pressure numbers will come from your doctor or your own blood pressure monitor. There will be two figures. Let’s say your blood pressure numbers are 130 (top figure-systolic) and 80 (bottom figure-diastolic). This will be read as '130 over 80' and written as 130/80. range than other people so talk to your doctor for advice. 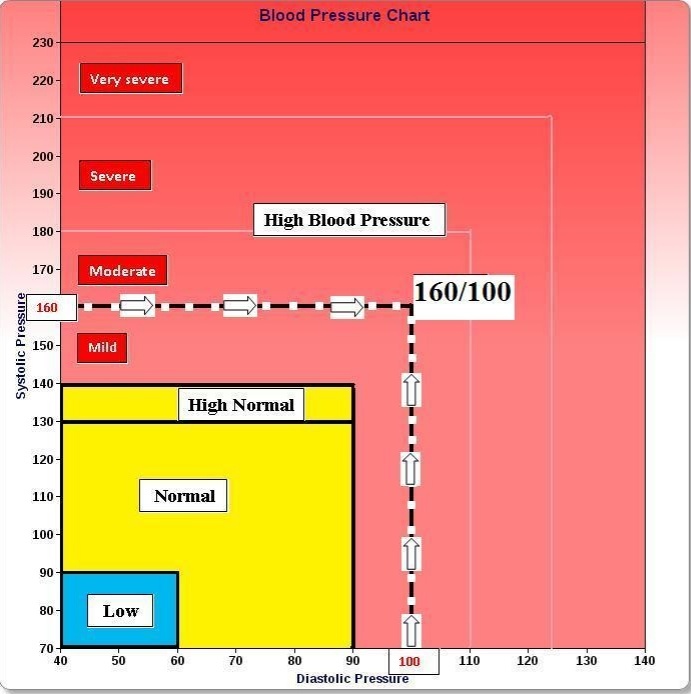 Take your first blood pressure reading figure (systolic pressure) and put your left index figure on that number on the left of the blood pressure chart (on the vertical line) marked systolic. Take your second figure (diastolic pressure) and put your right index finger on that number on the bottom line of the chart (the horizontal line marked diastolic). Now move your left finger in a straight line to the right and take your right finger in a straight line up until both fingers meet. This point will be in one of the three coloured squares on the blood pressure chart. If your blood pressure reading fits within the yellow area then you are in the healthy range and your blood pressure reading is considered a normal blood pressure reading. If you are either in the blue (too low) or red area (too high) of the blood pressure chart then you need to get some medical advice. The high normal range is also of concern (130-140 systolic) but implementing dietary and exercise strategies at this stage can return blood pressure to the normal blood pressure range fairly quickly. It is a measurement of the pressure in your arteries and is measured by how high your blood can push an amount of mercury in a tube, although other methods are also used. The normal blood pressure range is between 90 to 130 (the top figure) and 60-90 (the bottom figure), i.e. blood pressure readings between 90/60 and 130/90 are considered normal. Ideal blood pressure is 120/80 and is an average blood pressure for a healthy population. The first figure (120) is called the systolic blood pressure. The second figure (80) is called the diastolic blood pressure. 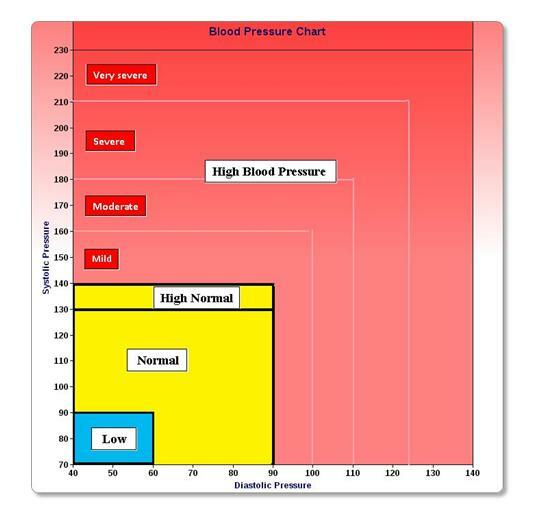 High blood pressure, also known as hypertension, is the area in red on the blood pressure chart. Anywhere above 140 systolic and 90 diastolic is high blood pressure. So if either of your blood pressure numbers are greater than 140 systolic or 90 diastolic then you have high blood pressure. Above these levels you will have increased risk of developing hardening of the arteries, heart disease, kidney disease, eye damage, stroke and shortened life expectancy. One in three Americans have high blood pressure and supposedly 1 in 5 deaths is caused by high blood pressure each year. If you are diagnosed with high blood pressure a home blood pressure monitor can be a good investment to keep track of your progress and will provide a more accurate record of your blood pressure than the occasional visit to your doctor. Find out about home blood pressure monitors here. Hunter-gatherers living on a traditional diet do not have high blood pressure and neither does their blood pressure rise with age (as it does with us). This indicates that lifestyle might be the key. Our modern patterns of diet and exercise are far from ideal and disconnected from our biological evolution over millenia. The good news is that if it is a lifestyle disease, you can fix it by changing your lifestyle. By adopting aspects of the lifestyles of hunter-gatherers we can lower blood pressure quickly (for some within a week). It doesn't take much to make your blood pressure normal, except maybe a little discipline to start. If you want to lower blood pressure naturally see my book the New High Blood Pressure Diet at www.new-high-blood-pressure-diet.com for more information. The body can tolerate high blood pressure for a long time before you show symptoms. These can include: pounding in the ears, a bloody nose, headache and feeling dizzy. They tend to show up, if at all, when high blood pressure is well advanced. However, one product that has some scientific backing and a lot of anecdotal evidence (i.e. personal experiences) is resveratrol. It is a very good product but don't rely on supplements alone. Good nutrition and exercise are the real long-term high blood pressure cures.